Last week marked the 50th anniversary (February 2, 1969) of the passing of Boris Karloff, one of the most significant figures in horror film history. But despite his menacing demeanor, vaguely Eastern-European-sounding name, and penchant for playing monsters, they say Boris Karloff was actually a very proper Englishman whose true passions in life were gardening and cricket. He was born William Henry Pratt in 1887 in London, the youngest of nine children. His choice to pursue an acting career met with disapproval from his family, who expected him to follow his older brother, Sir John Thomas Pratt, into the British Foreign Service. But all his life, he had wanted to become an actor… so he deliberately failed the Consular Service exam. According to his daughter Sara Karloff, he got his dark looks from East Indian ancestry in his father’s family. She also said that Karloff was an old family name on his mother’s side, and that he changed his name to avoid embarrassing his family. He also said that he thought Pratt wasn’t a good name for an actor – it reminded him of pratfalls. Why Boris? He chose it because it sounded good. He didn’t get his first starring role until age 43. He also got a late start on fatherhood – his only child, Sara, was born on his 51st birthday. He was a fan of the hit song “Monster Mash” and even performed it on a TV special. And Tim Burton’s Ed Wood (1994) notwithstanding, there was no “bad blood” between Karloff and Bela Lugosi. 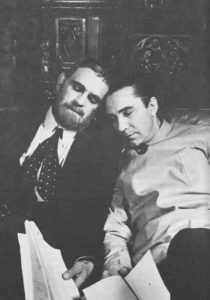 In fact, they often worked together on films and got along well. The feud rumor was encouraged by the studio for publicity purposes. 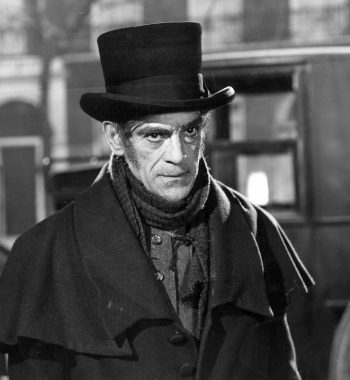 For more fascinating facts about Boris Karloff, check out this article at Decades.com! I did not know any of these things! Monster Mash I gotta see. If he were a young actor tday, I wonder what he’d be doing.